Yet a handful of European airlines still prefer to intimidate, subtly pressure or completely silence their crews. Management strategies from the union-busting handbook have obstructed pilots from speaking with one voice. Now, the recent cancellation crisis shows there is a new generation of pilots to act . They no longer agree with having their contracts changed unilaterally (when they have a contract at all…). They want to negotiate as a group, on equal terms with their management. They want to elect their pilot leaders. They want their representatives to stand up and speak on their behalf, without fear of punishment or worse - losing their job. This #PilotUnity struggle is more intense than ever before. And pilots need your support! We have set up this benevolent fund to provide a safety net for pilot leaders. It is available to those who find themselves out of a job in direct consequence of stepping forward as a representative to voice concerns and to assert the pilot profession’s right to Freedom of Association and Collective Bargaining. 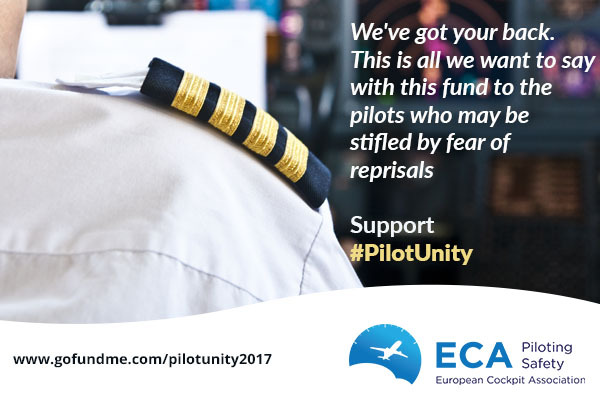 The fund is administered by the European Cockpit Association on behalf of the entire pilot community, with the sole purpose to provide financial security to such pilot leaders, having distinguished themselves in the struggle for collective representation. Whether you have been a vocal supporter of fair direct employment, or you too are a flying professional, or you believe that all people are entitled to stand up for their rights without being punished for it, you can show your support by contributing to this #PilotUnity Fund. The recent momentum creates the opportunity for historical change. But the precondition to achieve it is that we stand strong and united behind the colleagues who put themselves in the forefront. With this #PilotUnity fund we are assuring them that they have nothing to fear, and at the same time spreading the message that the pilot community is one, united and determined to go in one direction. Details on how the #PilotUnity fund will be administered are available on ECA’s website [see pdf ]. If you are considering a major donation that might need specific consideration, please get in touch with ECA first. 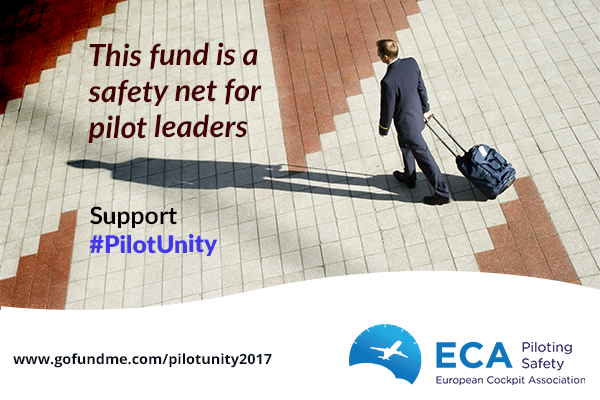 After careful consideration, the ECA Board approved the use of the Pilot Unity fund to support two* more European pilots who have recently been dismissed. 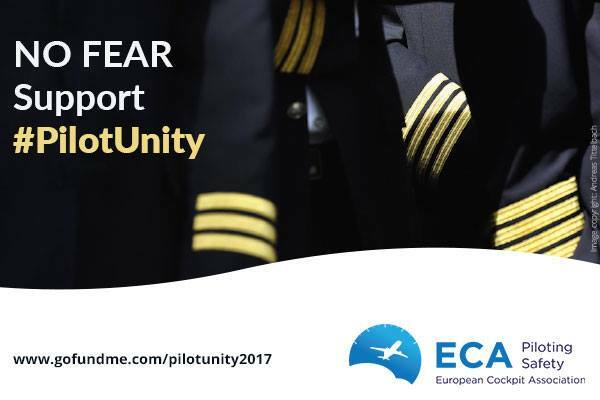 Both pilots are nominated for support by an ECA Member Association. The first case concerns a pilot who was dismissed in August 2018. S/He has been actively involved in union work and the legal team of her/his union is looking into the case and providing support. The second case concerns a pilot who is not an active union leader but s/he lost her/his job as a collateral damage of the first representative’s activity. The committee reviewing the case could establish that the dismissal of the applicant would not had occurred if the action reproached by her/his employer had not involved a union representative. The applicant would already be in the process of getting a new job. 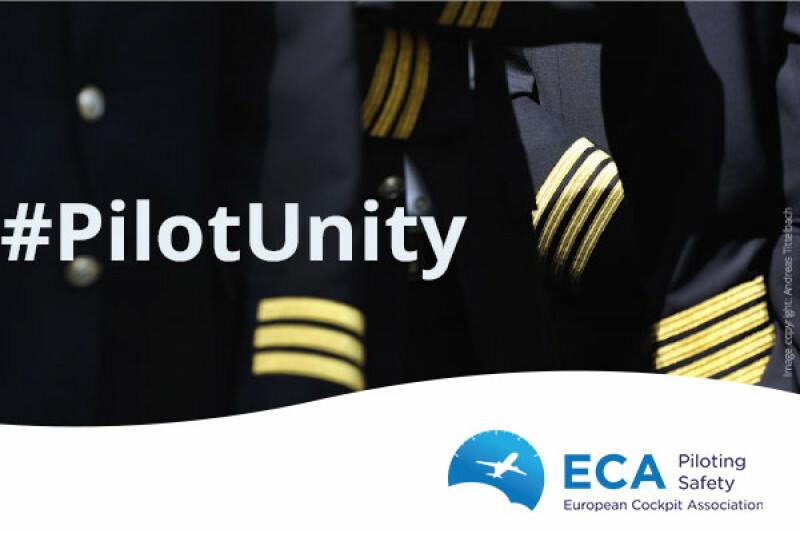 The Member Association nominating this pilot for the Pilot Unity Fund confirmed that no other fund or possibility of compensation is available for this person. 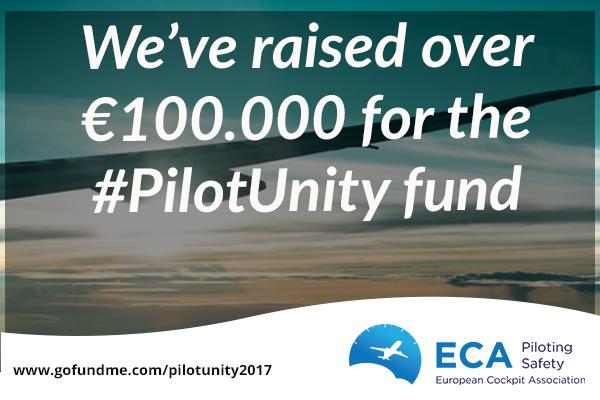 The #PilotUnity fund raised over 150.000 euro from individual and organisational contributions and had already been used for two previous cases (see March 2018 update). This is a strong statement that pilots are united behind a common cause. Targeting and trying to silence union leaders is a strategy that will simply not work any longer. On behalf of the 2 pilots: A big thank you! *The ECA Board would like to preserve the privacy of those two pilots and will not publicly reveal their identities. The requirements to benefit from this fund are available on the ECA website (see #PilotUnity fund campaign). Pilots are to be nominated through their union. If you think you qualify for support, contact your national ECA-affiliated pilot union/association. We're glad to have reached the €100.000 milestone in such a short time. It's an incredible achievement & shows the level of commitment of the entire pilot community. Thank you for the support of this #PilotUnity fund! Good Luck. I wish you clear sky and safe flight ! Airline pilots are amongst the least protected workers in the EU. Shame on our governments and on companies like Ryanair. Pilots losing a job as a result of union activities is back to the year 1880.